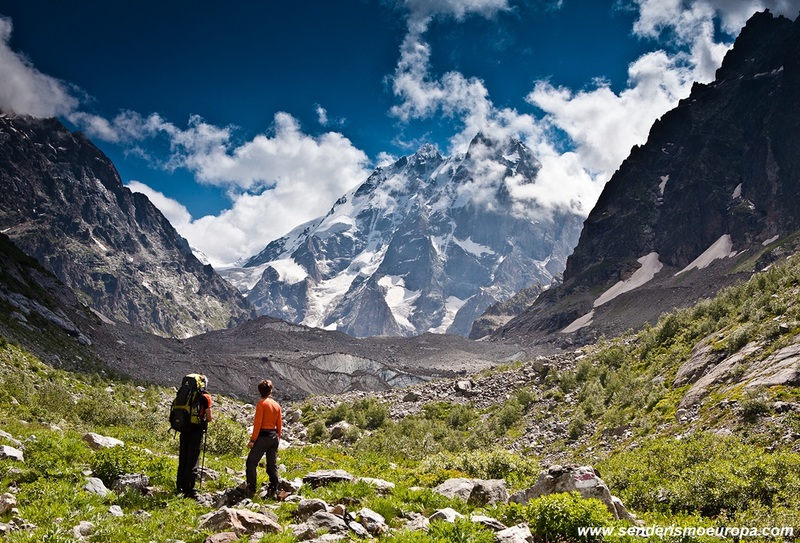 Hiking trail in Georgia – the best of the Caucasus. Any traveler in search of new adventures in Georgia find a unique destination for its unspoiled nature, its rich cultural legacy, their traditions, its typical architecture, your kitchen, its wine and the hospitality of its people. 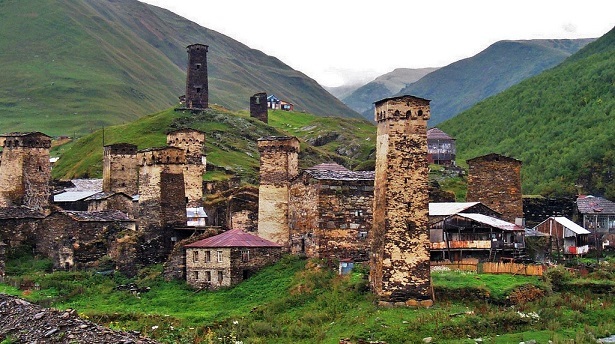 Here, on the slopes of the Caucasus Mountains of Georgia, among these small mountain towns, Sometimes you feel as if time had stood still for decades. The route crosses the Georgian region of Svaneti between the villages of Mestia and Ushguli, towns characterized by their former defensive towers medieval style. These towers were used in the past as lookouts to warn of possible attacks by neighboring towns or regions, It was a difficult time and with limited resources where theft and looting were common, in fact in the same village you can find several towers, with only one was enough to warn of attacks from other towns, however each family built its own tower to also monitor their neighbors since neither of them were wary. When there were attacks from nearby villages whole family took refuge in the tower since the middle floors of the tower could be used as bedrooms. 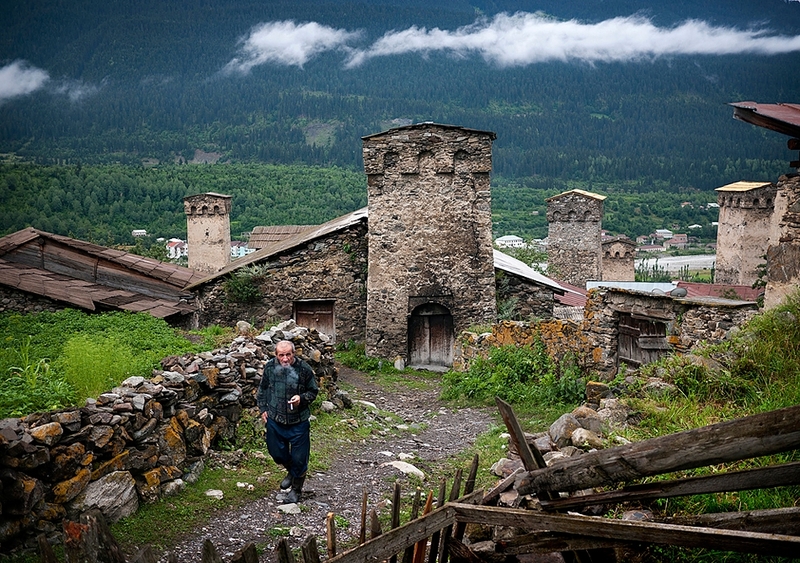 The town of Mestia is the largest region of Svaneti, abound guesthouses and small hotels for hikers. Meanwhile the village of Ushguli ( it really is a commonwealth of 4 towns) is UNESCO World Heritage, mainly for its famous towers and well-preserved folk architecture, It is also the highest altitude inhabited village in Europe, above 2.000 meters. Unfortunately the Transcaucasian route is undeveloped yet because the trails are still unmarked and the part that crosses Georgia is hard to follow. Generally in the Svaneti region of Georgia it is very easy to miss if you do not have the assistance of a good local mountain guide. 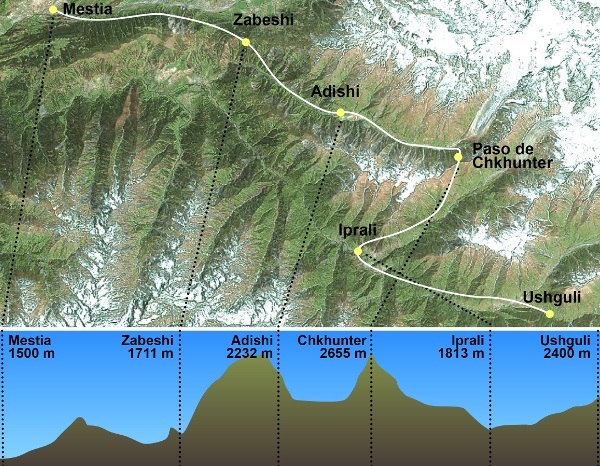 There are countless routes other than the Transcaucasian route in this region, from moving towards Mount Ushba, the highest in Georgia, with its picturesque summit consists of two peaks 4.710 Y 4.690 meters, to trek between the different peoples of the region of Svaneti: Adishi, Iprali, Zabeshi, Lakhushdi, or said Mestia and Ushguli. If you are thinking of traveling to Georgia, Local guides can be of great help with language, in Georgia and Georgian is spoken in the region of Svaneti also speaks “svano”, both are languages ​​that use their own alphabet, indecipherable to outsiders. In addition although urban youth have knowledge of English, in mountain areas through which it passes this hiking trail in Georgia is more difficult to find people who speak English and we can advise on the way.